On April 28th, the Communist Party of the Philippines (CPP) announced that its military wing, the New People’s Army(NPA), injured a U.S. soldier embedded with the Philippine Army. According to the CPP, the Philippine Army attempted to encircle and attack a unit of the NPA, at which point the U.S. troop was injured, three Philippine state soldiers were killed and one NPA fighter was martyred. 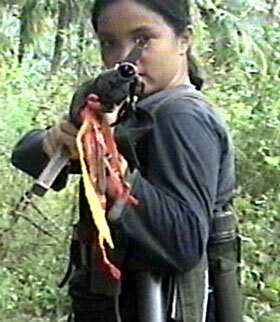 The New People’s Army, founded in 1969, has led South East Asia’s longest running insurgency. In 2002, both the CPP and the NPA were added onto the U.S. State Department’s list of foreign terrorist organizations. The Philippines was one of the first overseas colonies of the United States. Today, U.S. imperialism rules through proxy governments. Though the U.S. has not operated military bases in the Philippines since 1991, U.S. troops are stationed in the country to augment the police powers of the comprador Philippine state. In 2008, the U.S. provided the Philippine state with 30 million dollars in military aid and admits to providing training, intelligence and consulting in its crusade against a number of insurgencies. While the U.S. claims its troops in the Philippines are limited to “humanitarian” roles, the CPP and independent NGOs have in the past stated that the United States is directly involved in military operations in the country. More often than not, we are used to hearing about the U.S. military operating in Iraq and Afghanistan. This most recent incident sheds light on the fact that the U.S. military is used against peoples’ resistance even when it’s not widely publicized. The United States is not just involved in overthrowing recalcitrant governments; it also quietly supports its unpopular puppet-governments against the threat of homegrown insurgencies. In reality, the vast majority of Amerikans hardly oppose U.S. aggression and bullying. This is because they have historically benefited from imperialism and continue to until this day. While the U.S. military may be currently bogged down in other regions of the world, relying on a non-existence shared interest with “the vast majority” Amerikans or any meaningful support on their part is not a viable long term strategy in struggle of the Filipino masses against imperialism and lackey capitalism.